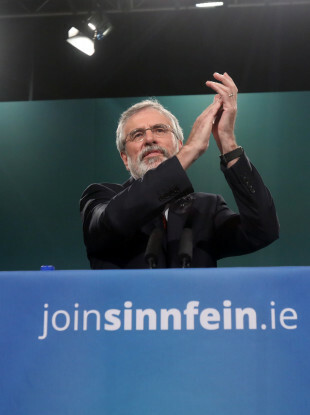 GERRY ADAMS HAS announced that he will stand down as president of Sinn Féín next year. In his address to the Ard Fheis, Adams said that the time has come for him to pass the baton to the new generation of Sinn Féin politicians. He also confirmed that he will not stand in the next Dáíl election. “I have complete confidence in the leaders we elected this weekend and in the next generation of leaders,” he said. The Ard Comhairle will meet within the next two weeks to decide the date for the special Ard Fheis. Adams said there were plans for the generational change within the party, but then “life punched us in the face”, he said, referring to Martin McGuinness’ sudden illness. Adams also used his last speech as president to hit out against Taoiseach Leo Varadkar. Who here remembers Margaret Thatcher? … Thatcher is gone but her legacy lives on in our Taoiseach. His republic is limited to 26 counties and extends only to those who get up early to go to the gym, on the way to a highly paid job, with big expenses and a gold plated pension. Adams has been leader of the party for 34 years. Last September he said he would detail the party’s planned “process of generational change” which is part of the party’s ten-year plan on an “orderly leadership change” drawn up with the help of Martin McGuinness. Adams was re-elected as president of the party this evening. The Sinn Féín delegation has also voted this evening that there should be a special Ard Fheis held three months after Adams steps down from his position. Email “Gerry Adams announces he is to step down as Sinn Féín president next year”. Feedback on “Gerry Adams announces he is to step down as Sinn Féín president next year”.